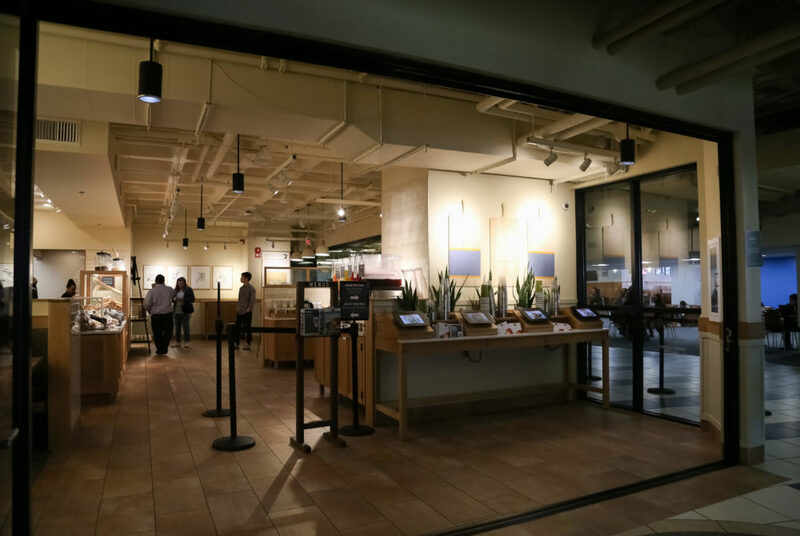 Panera Bread replaced J street, the former dining hall on the Foggy Bottom Campus, on the first floor of the Marvin Center in January. When students arrived back on campus this semester, they found one noticeable restaurant replacement that stood out above every other renovation. Freshly baked pastries, salads, sandwiches and soups are now offered at Panera Bread on the ground floor of the Marvin Center. The spot occupies the space that formerly housed J Street, Foggy Bottom Campus’ traditional dining hall that closed in 2016. Students eagerly awaited the restaurant’s arrival since its announcement in May until it opened in January. The opening not only provided students with a national chain that serves food they want to eat, but it also coincided with renovations to the Marvin Center’s first floor, which paired well with a student area that now has more furniture, televisions and a conference room. Panera has a rich menu, from savory sandwiches to flaky baked goods. The notorious macaroni and cheese is a creamy and heavenly dish, coming in a small ($5.29) and large size ($8.19). For salads and sandwiches, there is a half and a whole option for about $5 and $9, respectively. Compared to J Street’s staples of a limp salad bar and greasy chicken tenders that were more breading than chicken, the variety and convenience of Panera Bread means you can find a different meal to try every day of the week. Unlike the pay-by-weight plan for about $8 per pound of bland food from the former dining hall, Panera’s prices won’t often have you feeling sold short on price or taste. Panera Bread has an array of beverages like coffee, tea and smoothies, along with frozen drinks in flavors like caramel and mocha offered right in the center of campus. This shop has your back like J Street’s coffee bar never did because of its quick service, a rapid pick-up option for mobile orders and kiosks to skirt the line.